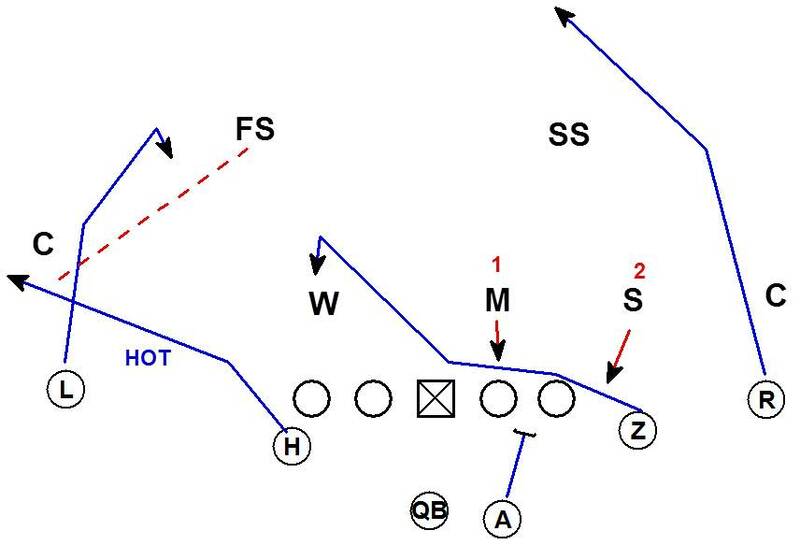 #3 Shallow Spot - Release at heels of DL, climb to 5 yds as you cross center. Spot is over opposite OT. 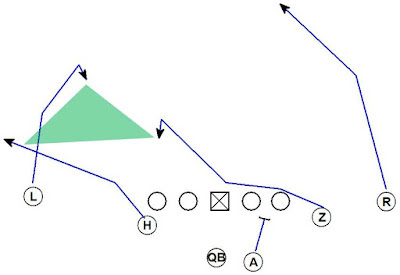 The route creates a weak side triangle read for the QB. 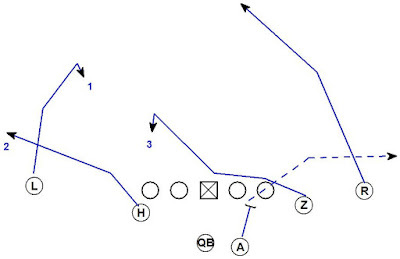 Against Cover 1 or a match up Cover 3 the throw should go to the #1 read Curl route. The H is gaining width quickly to open the window. The L should stick his outside foot on the 3rd step and stem inside. 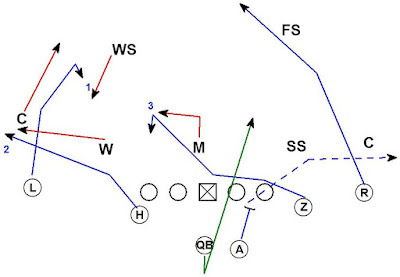 The goal is to get the corner on top the route, with his hips open and running before the curl breaks off. Against a 1 high zone coverage, the H back is again trying to open the curl's window. If the curl is available the ball is going there. 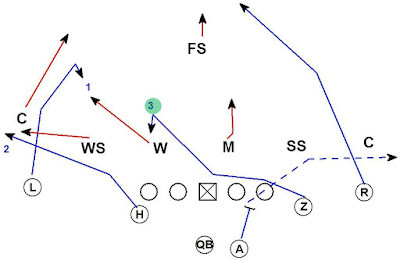 This happens when the Hook defender (here the Will LB) does not expand. 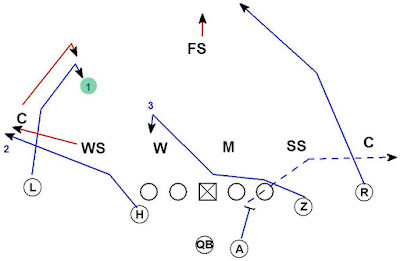 The Curl-Flat defender may hang in the curl's window. 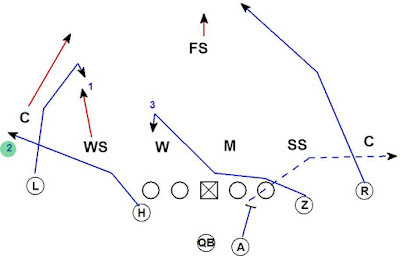 In this case the throw goes to the #2 read H on the flat route. 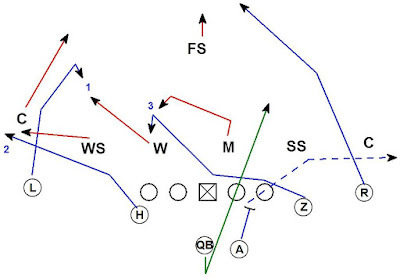 In a zone if the Curl-Flat defender and the Hook defender both expand the throw is going to the Spot route on the inside of the triangle. For the coverage to take away all 3 reads, the strong side Hook player must work weak with the Spot route. 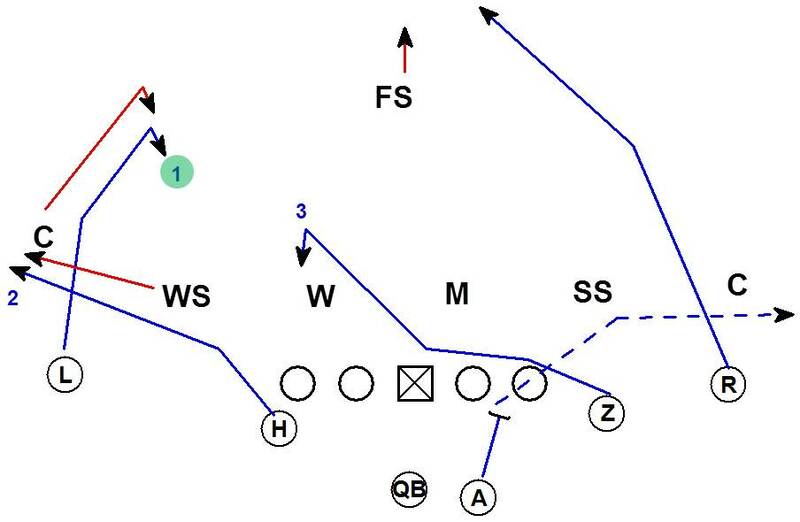 By check releasing the A back into the strong flat the QB has a natural escape lane. 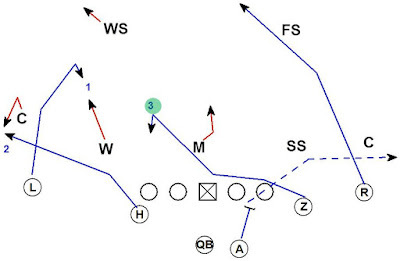 The spot route controls the Strong Hook dropper (Mike) and the check release by the A back widens the strong Curl-Flat defender (SS).The 4th read is to tuck the ball and run. 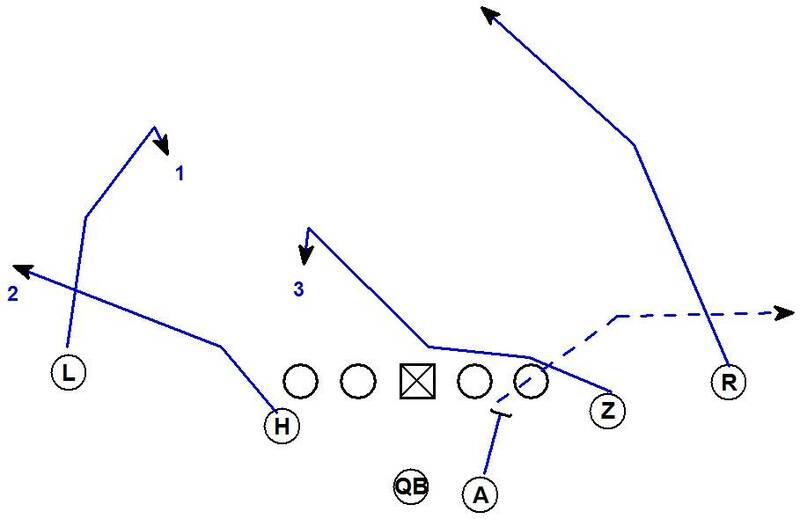 Against a weak side cover 2 or 2 read concept the corner has good leverage on the Flat route. The Hook dropper should be able to drop into the window of the Curl. If the Curl is open the ball is going there but it is unlikely. 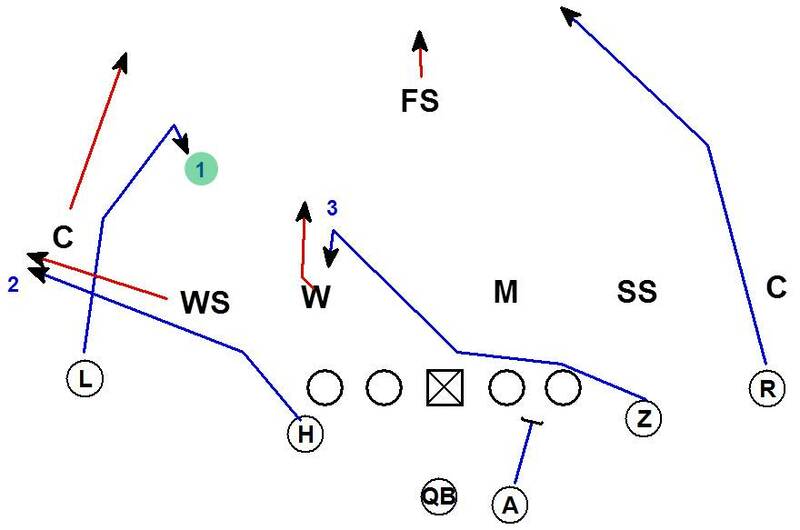 This most likely brings the read to the Spot route. 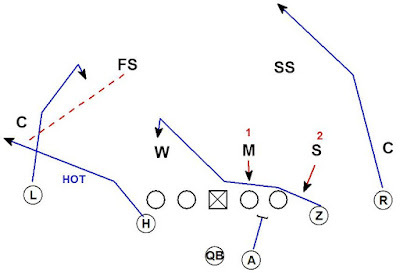 Against a Quarters coverage concept there may be double coverage on the Curl. If the Curl does a good job of selling the stick and pushing the safety the curl may be able to break underneath the safety. If the curl is open that is where the ball is going. More likely vs. Quarters the Safety will close the window to the curl. 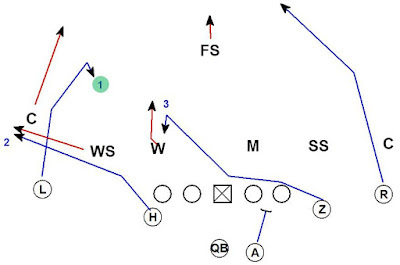 The flat player is expanding with the Flat route. 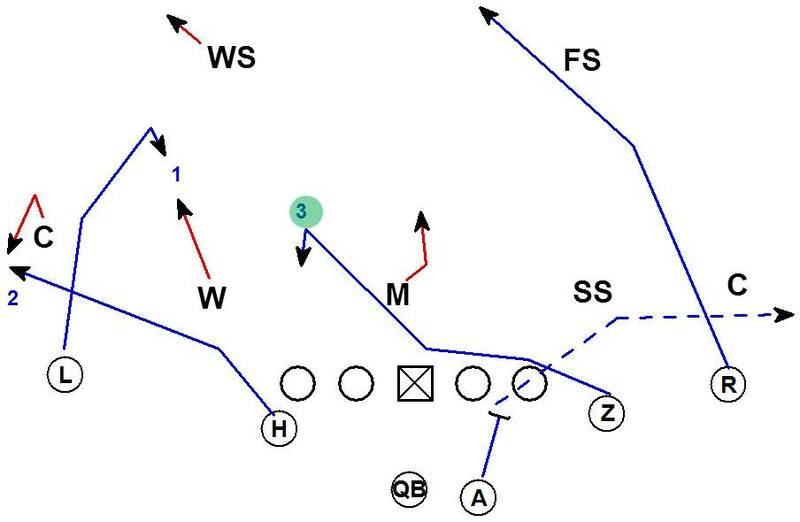 This brings the read back to the Spot route. 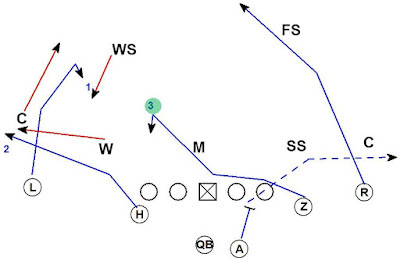 In a 2 high coverage the Spot route is 1 on 1 with the Mike. 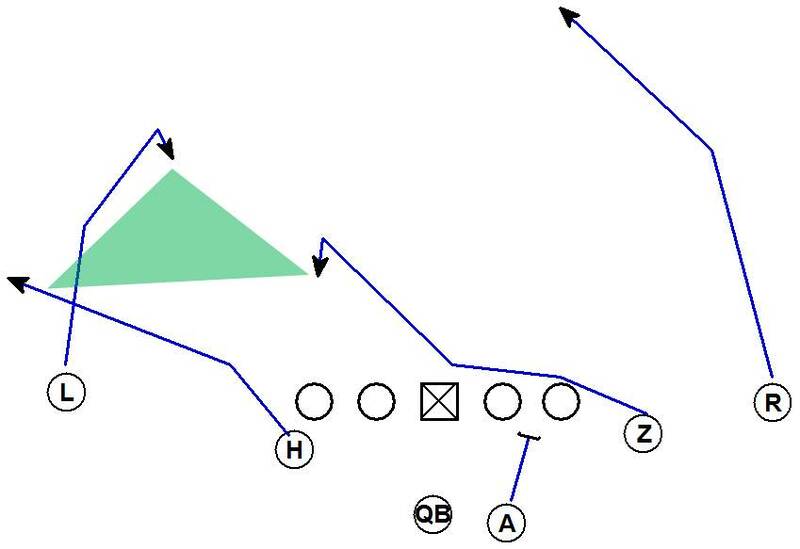 If the Mike works weak to take the Spot route the QB goes to his 4th read of run. 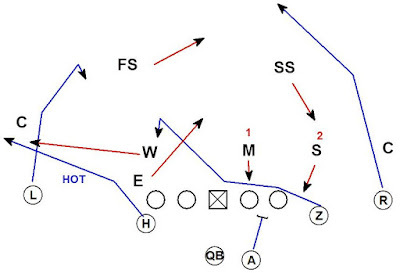 The H back on the Flat route is the hot throw. The protection is a 6 man check release. 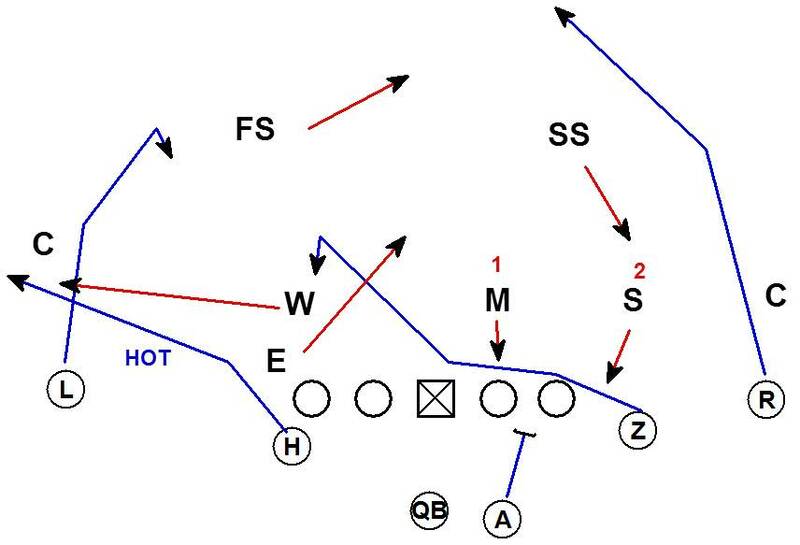 The most common way to force a hot throw is to bring 2 rushers to the side of the A back. 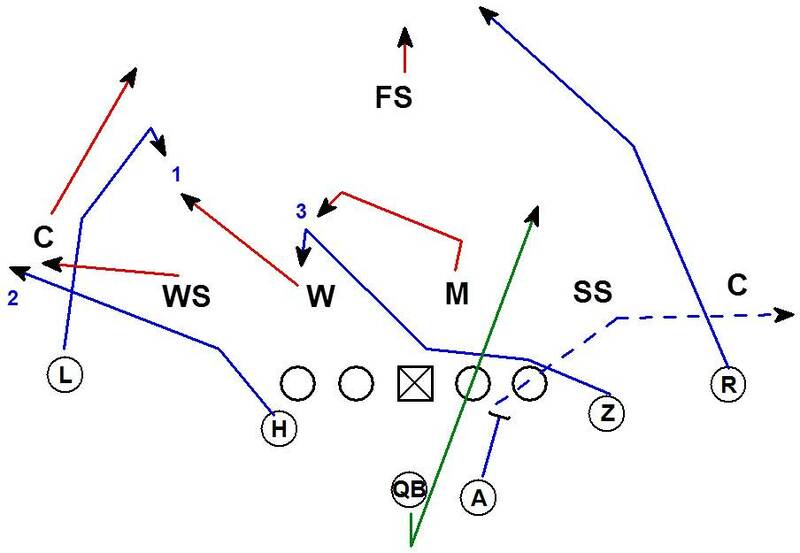 If the coverage is man the weak side safety has the flat route 1 on 1. 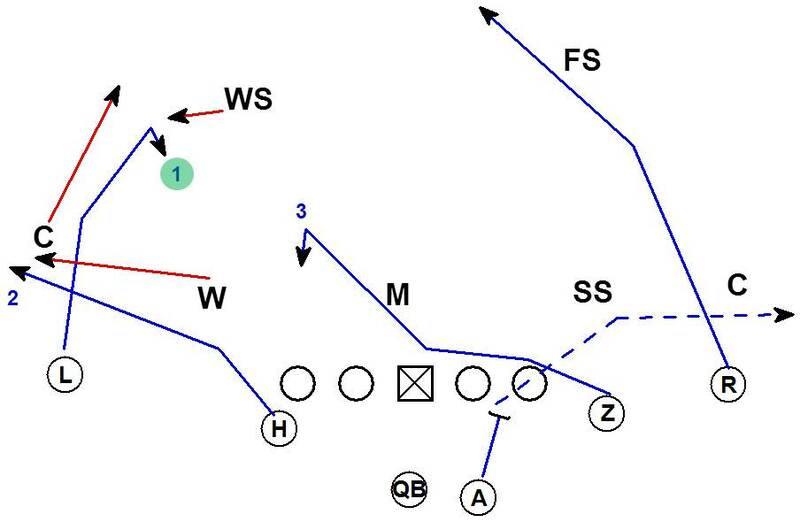 If the coverage is a fire zone the LB is the Seam or Scif dropper vs. a 2x2. 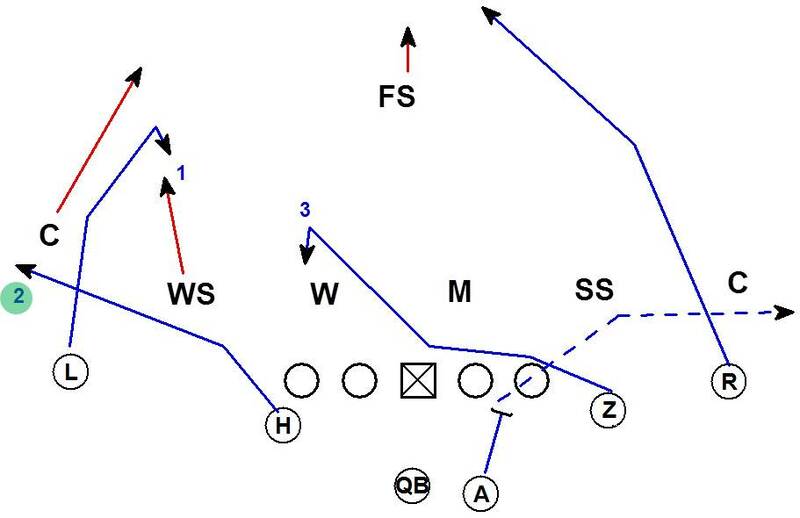 Again the H back is expected to win 1 on 1.